“Fiesta Day” was the theme Generations at Columbus Park’s 21st annual friends and family day. Their annual day is a time to give back to the community, residents and supporters as well as open our doors to families and guests who want to become familiar with the facility and their services. 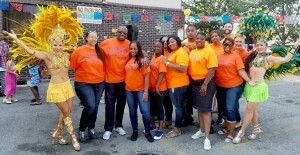 The sun shined brightly as residents and staff gathered outside for food, entertainment and fun! The sounds of laughter from visiting children and vivacious greetings and big hugs from family members filled the air. Residents, staff and guests also enjoyed live entertainment with carnival dancers. Generations at Columbus Park’s residents moved along to the music and learned new dance moves! As the event came to a close everyone commented on how much they enjoyed the event. Visiting families were impressed with the facility and were happy they were able to enjoy the day with their loved ones. Thank you to all the volunteers and staff who made this a successful day. Also thank you to the families as well as old and new friends who visited. See you next year!